Camille Pissarro (10 July 1830 – 13 November 1903) was a Danish-French Impressionist and Neo-Impressionist painter born on the island of St Thomas). His importance resides in his contributions to both Impressionism and Post-Impressionism. Pissarro studied from great forerunners, including Gustave Courbet and Jean-Baptiste-Camille Corot. 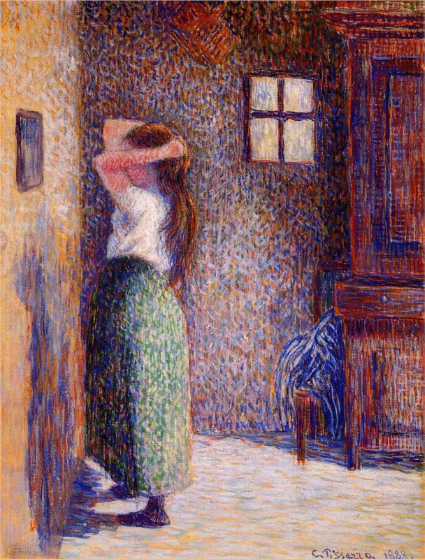 He later studied and worked alongside Georges Seurat and Paul Signac when he took on the Neo-Impressionist style at the age of 54. In 1873, Camille Pissarro helped establish a collective society of fifteen aspiring artists, becoming the "pivotal" figure in holding the group together and encouraging the other members. Art historian John Rewald called Pissarro the "dean of the Impressionist painters", not only because he was the oldest of the group, but also "by virtue of his wisdom and his balanced, kind, and warmhearted personality". Cézanne said "he was a father for me. A man to consult and a little like the good Lord," and he was also one of Gauguin's masters. Renoir referred to his work as "revolutionary", through his artistic portrayals of the "common man", as Pissarro insisted on painting individuals in natural settings without "artifice or grandeur". Camille Pissarro is the only artist to have shown his work at all eight Paris Impressionist exhibitions, from 1874 to 1886. He "acted as a father figure not only to the Impressionists" but to all four of the major Post-Impressionists, including Georges Seurat, Paul Cézanne, Vincent van Gogh and Paul Gauguin. Impressionist group. His work has also been described by art historian Diane Kelder as expressing "the same quiet dignity, sincerity, and durability that distinguished his person." She adds that "no member of the group did more to mediate the internecine disputes that threatened at times to break it apart, and no one was a more diligent proselytizer of the new painting." According to Camille Pissarro's son, Lucien, his father painted regularly with Cézanne beginning in 1872. He recalls that Cézanne walked a few miles to join Pissarro at various settings in Pontoise. While they shared ideas during their work, the younger Cézanne wanted to study the countryside through Pissarro's eyes, as he admired Pissarro's landscapes from the 1860s. Cézanne, although only nine years younger than him, said that "he was a father for me. A man to consult and a little like the good Lord." 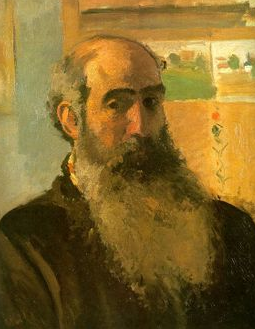 "If we observe the totality of Camille Pissarro's work, we find there, despite fluctuations, not only an extreme artistic will, never belied, but also an essentially intuitive, purebred art ... He was one of my masters and I do not deny him."